Union Street Bar is a cool cocktail bar below Gordon Ramsay's Union Street Cafe. 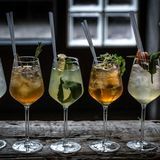 Making the most of seasonal ingredients, Union Street Bar sees head bartender Davide Gagliazzo create signature cocktails with an Italian influence. What did you think of Union Street Bar? The basement bar below Gordon Ramsay’s Union Street Café is a cool kind of hangout for late-night dates and classy catch-ups without the formality. In among the studio spaces and industrial-looking buildings of Southwark sits Gordon Ramsay’s Union Street Café, where Great Suffolk Street meets the eponymous Union Street. Although many visitors are here to test-drive the café that Beckham almost invested in, the bar attempts to be their first port of call, its stairwell down being the first thing you see as you enter the building. If the stairs don’t naturally lure you down, perhaps the stylish blue neon sign will catch your eye. Once in the basement, the look of the room won’t disappoint, as this bar certainly has a style of its own, even though it incorporates many modern bar trends with its industrial ceiling ducts, exposed brickwork and concrete floor. 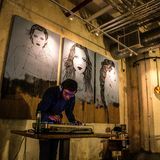 Decorative differences, though, include well-worn vintage rugs on the floor, an attractive jumble of reclaimed furniture and original paintings by contemporary urban artists on the walls, most of which is up for sale or has recently been sold. The ethos behind Union Street Bar is to create a local living room, and as such, the casual seating arrangements and cool aesthetic encourage lounging from customers. Groups gather in clusters around the room and couples on dates can opt for laid-back seating to take the edge off any awkward formalities. 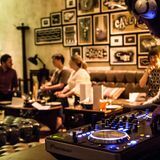 The low lighting also aids that date vibe, and should you choose a Thursday visit, your evening will be accompanied by a backing track of mellow live jazz – Fridays are more up-tempo though, with a DJ on from 7pm to 11pm. If you didn’t already feel at home, bar staff will do their upmost to ease you in, the bar manager greeting customers in a very natural fashion, and the rest of the staff forming an easy bond with guests scattered around the room. Bar snacks consist of Italian eats to mirror the food offering in the upstairs café. These snacks, or ‘assaggini’, include some particularly plump and lightly spiced nocellara olives (£4), which are beautifully green and juicy. For Italian meats, there’s bresaola and salami (£6), Parma ham (£6) or spiced mortadella (£6) to work through. Olive-oil-marinated artichokes (£4) are more on the light side if you fancy a dainty snack. And salted taralli (£4) are probably your best bet when hoping to soak up a drink or two – these little pretzel-shaped crackers have a moreish flavour and a crunchy breadstick texture. Although the bar snacks prove the quality of ingredients of Italian provenance, a few more creative options wouldn't go amiss, particularly when the cocktail menu takes such a modern look at Italian flavours and classic cocktails. 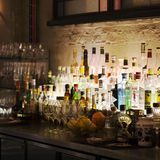 Although there’s no doubt hospitable bartenders can whip up any drink you desire, if you’re looking to keep to the cocktail list, a succinct and weekly changing line-up should provide enough scope. Some of the more popular drinks crop up regularly, like the Trenchtown Negroni (£8.50), a Jamaican twist on the stiff Italian drink, with Wray and Nephew rum and Red Label wine, combined with Nardini Rosso in place of Campari. Manderville and Co (£9.50) is another house favourite, thanks to its sweet, raspberry flavour. It blends Ketel One vodka with Chambord, raspberries, lemonade and basil to make a refreshing, long drink. Harling Fizz (£11) is on-trend, with Chase Marmalade vodka, ginger liqueur and lemon all combined with a refreshing and cool twist of cucumber water. Meanwhile, The Cut (£9.50) is as macho as its blunt name suggests, with Johnnie Walker Black Label the dominant flavour, although clementine syrup, lemon juice and bitters are used to take off the edge just a touch. The basement bar at this Gordon Ramsay venture has lots of style to offer, with a talented team of bar staff, a regularly changing list of on-trend cocktails and a pretty cool look that's all of its own.